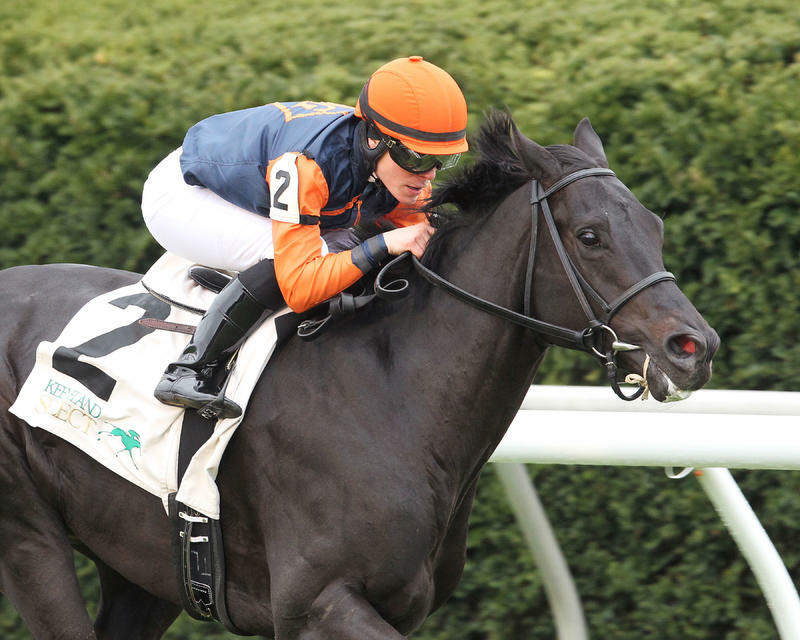 Ken and Sarah Ramsey’s Big Blue Kitten, the champion older turf male of 2015, headlines a field of 13 entered Wednesday for the 29th running of the $500,000 Woodford Reserve Turf Classic (GI) run at 1 1/8 miles on the Matt Winn Turf Course Saturday. The Woodford Reserve Turf Classic is one of six graded stakes leading up to the 142nd running of the $2 million Kentucky Derby Presented by Yum! Brands (GI) and one of three Grade I races on the program. Sprinters will be in the spotlight for the 30th running of the $300,000 Humana Distaff (GI) for fillies and mares and the 82nd running of the $500,000 Churchill Downs (GII), both at seven furlongs. 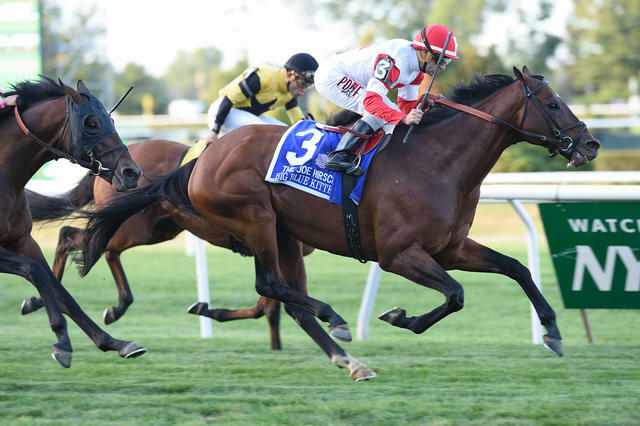 Also on the Derby undercard are two Grade II turf tests – the 31st running of the $300,000 Churchill Distaff Turf Mile and the $300,000 American Turf – as well as the 92nd running of the $250,000 Pat Day Mile (GIII). The Woodford Reserve Turf Classic will go as the 11th race with a 5:25 p.m. (all times Eastern) post time. Trained by Chad Brown, Big Blue Kitten will be making his 2016 debut after a campaign that included two Grade I victories and a third-place finish in the Breeders’ Cup Turf (GI). Joe Bravo has the mount and will break from post position 12. Chief among Big Blue Kitten’s rivals is Slumber (GB). Owned by Michael Dubb, Sheep Pond Partners and Bethlehem Stables’ Slumber also will be making his 2016 debut. Slumber was a half-length behind Big Blue Kitten in the Breeders’ Cup Turf to conclude a campaign that also included a victory in the Manhattan (GI). Irad Ortiz Jr. has the mount on Slumber and will break from post position six. The field for the Woodford Reserve, with riders and weights from the inside, is: Grand Tito (Emisael Jaramillo, 120 pounds), Chocolate Ride (Javier Castellano, 120), Bolo (Mike Smith, 118), Danish Dynaformer (John Velazquez, 118), Reporting Star (Luis Saez, 118), Slumber (GB) (Ortiz Jr., 120), Midnight Storm (Victor Espinoza, 120), Divisidero (Edgar Prado, 120), Triple Threat (FR) (Jose Lezcano, 120), Tourist (Florent Geroux, 118), World Approval (Julien Leparoux, 120), Big Blue Kitten (Bravo, 124) and Kasaqui (ARG) (Paco Lopez, 118). Michael Dubb, David Simon, Head of Plains Partners and Bethlehem Stables’ Wavell Avenue, winner of the 2015 Breeders’ Cup Filly and Mare Sprint (GI) at Keeneland, heads a deep field of 10 for the 30th running of the $300,000 Humana Distaff (GI) at seven furlongs on the main track. The Humana Distaff will go as the eighth race with a 2:45 p.m. post time. Trained by Chad Brown, Wavell Avenue finished third in her 2016 debut in the Madison (GI) at Keeneland. Joel Rosario has the mount and will break from post position 10. Main threats to Wavell Avenue are coming from the West Coast and the East Coast. Coming in from California is Michael Tabor, Derrick Smith and John Magnier’s Taris. Trained by Simon Callaghan, Taris is a four-time graded stakes winner and enters the Humana Distaff off a runner-up effort in the Santa Margarita (GI). Flavien Prat has the mount and will break from post position eight. Coming in from Florida is Stoneway Farm’s Stonetastic. Trained by Kelly Breen, the multiple graded-stakes winner is riding a two-race win streak with the most recent coming in the Inside Information (GII) at Gulfstream Park on March 19. Paco Lopez has the mount and will break from post position two. The field for the Humana Distaff, with riders and weights from the inside, is: Sarah Sis (Florent Geroux, 120 pounds), Stonetastic (Lopez, 120), You Bought Her (Chris Landeros, 118), Spelling Again (Luis Saez, 120), Super Saks (Channing Hill, 120), Enchanting Lady (Javier Castellano, 118), Kathballu (Julien Leparoux, 118), Taris (Prat, 120), Birdatthewire (Mike Smith, 123) and Wavell Avenue (Rosario, 123). David Jacobson and Southern Equine Stable’s Salutos Amigos, winner of the Carter Handicap (GI) in his most recent start, and C R K Stable’s Kobe’s Back, the top sprinter on the West Coast, top a field of nine for the 82nd running of the $500,000 Churchill Downs (GII) at seven furlongs on the main track. The Churchill Downs will go as the seventh race with a 1:55 p.m. post time. Trained by Jacobson, Salutos Amigos also won the Tom Fool (GIII) after returning to New York following a two-race stay in California in which he finished second in the Palos Verdes (GII) and Midnight Lute (GIII). Cornelio Velasquez will have the mount and break from post position eight. Kobe’s Back, trained by Peter Eurton, won the Palos Verdes and, in his most recent start, the San Carlos (GII). Gary Stevens, who has won the Churchill Downs three times, has the mount and will break from post position one. Also expected to draw support is Katherine Ball’s Limousine Liberal. Trained by Ben Colebrook, Limousine Liberal established a Keeneland track record for 6 ½ furlongs in his 2016 debut on April 9. Luis Saez has the mount and will break from post position five. The field for the Churchill Downs, with riders and weights from the inside, is: Kobe’s Back (Stevens, 120 pounds), Squadron A (Corey Lanerie, 118), Calculator (Junior Alvarado, 118), Barbados (Florent Geroux, 118), Limousine Liberal (Saez, 118), Speightster (Jose Lezcano, 118), Holy Boss (Ricardo Santana Jr., 118), Salutos Amigos (Velasquez, 123) and Catalina Red (Javier Castellano, 118). Robert Masterson’s Tepin, who kick-started her 2015 Eclipse Award-winning campaign with a wire-to-wire victory on Derby Day, tops a field of nine fillies and mares entered for the 31st running of the Churchill Distaff Turf Mile (GII). 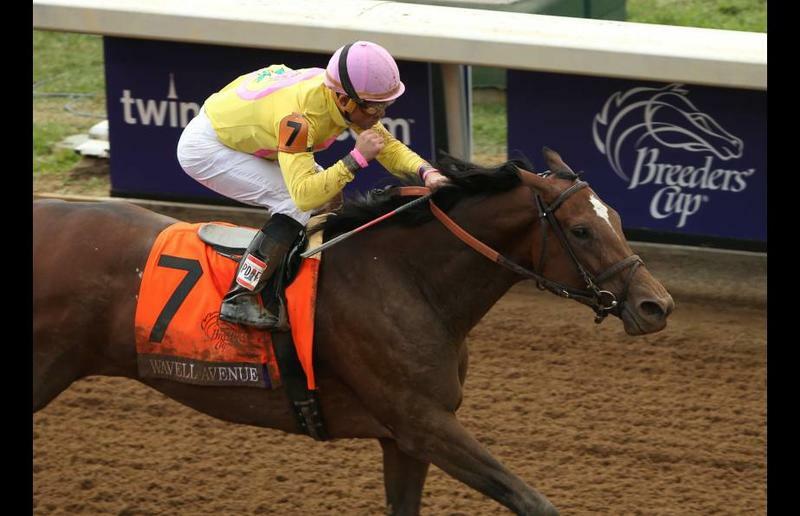 The Churchill Distaff Turf Mile will go as the sixth race with a 1:13 p.m. post time. Trained by Mark Casse, Tepin has won eight of her past 10 starts and five in a row. Among her victories are Grade I scores in the First Lady at Keeneland and the Breeders’ Cup Mile over males at Keeneland, as well as a five-length triumph in her most recent start in the Jenny Wiley at Keeneland. Julien Leparoux will ride Tepin, who will try to join Foresta in 1990-91 as the only repeat winner of the race. Tepin will break from post position one. Chief among Tepin’s rivals is Siena Farm’s Isabella Sings. Trained by Todd Pletcher, Isabella Sings led by as many as 18 lengths in her first meeting with Tepin before being caught late in the Hillsborough (GII) at 1 1/8 miles at Tampa Bay Downs. John Velazquez has the mount on Isabella Sings and will break from post position four. 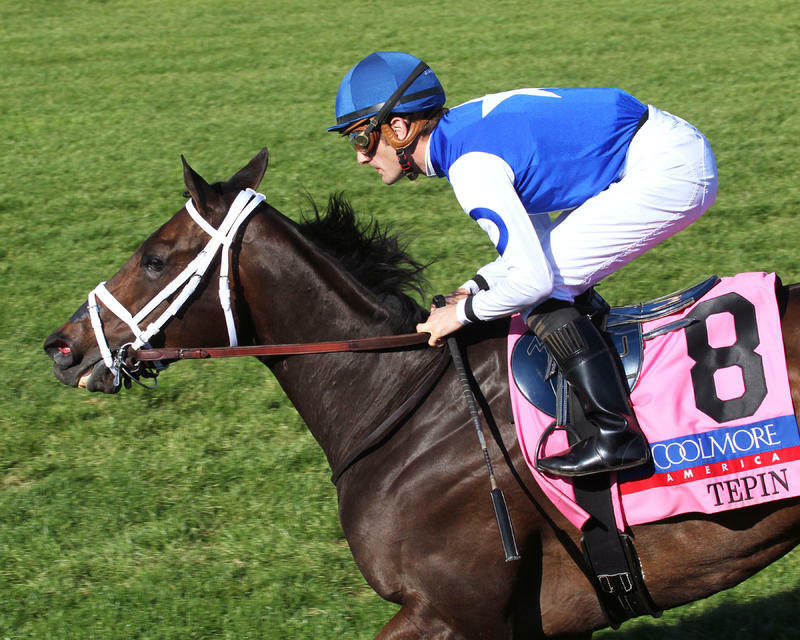 The field for the Churchill Distaff Turf Mile, with riders and weights from the inside, is: Tepin (Leparoux, 123 pounds), Josdesanimaux (Jose Lezcano, 118), Cash Control (Shaun Bridgmohan, 118), Isabella Sings (Velazquez, 120), Bureau de Change (Joel Rosario, 118), Ticking Katie (IRE) (Luis Saez, 118), She’s Not Here (Mike Smith, 118), Zipessa (Florent Geroux, 118) and Rainha Da Bateria (Javier Castellano, 118). Richard Hogan and Dan Gale’s Shakhimat, the front-running winner of the Transylvania (GIII) at Keeneland in his most recent start, and Budget Stable’s Dressed in Hermes, one of the top 3-year-old grass runner in California, headline a field of 13 for the 25th running of the $300,000 American Turf (GII) at 1 1/16 miles. The American Turf will go as the ninth race with a 3:35 post time. Trained by Roger Attfield, Shakhimat came off a five-month layoff to win the Transylvania by 3 ¼ lengths. Emma-Jayne Wilson will have the mount and break from post position eight. Dressed in Hermes, a three-time stakes winner on turf in Southern California, comes into Saturday’s race off a victory in the Pasadena Stakes March 13 at Santa Anita. Trained by Janet Armstrong, Dressed in Hermes will break from post position 11 and be ridden by Mike Smith. The field for the American Turf, with riders and weights from the inside, is: Airoforce (Julien Leparoux, 120 pounds), Cutacorner (Jon Court, 118), Converge (Javier Castellano, 120), Beach Patrol (Flavien Prat, 118), Frank Conversation (Mario Gutierrez, 120), J R’s Holiday (Emisael Jaramillo, 120), Two Step Time (Joel Rosario, 118), Shakhimat (Wilson, 120), Camelot Kitten (Irad Ortiz Jr., 118), American Patriot (Florent Geroux, 118), Dressed in Hermes (Smith, 120), Surgical Strike (Luis Saez, 118) and Azar (John Velazquez, 123). Reddam Racing’s Ralis, winner of the Hopeful (GI) last September and most recently serving as the workmate for Kentucky Derby favorite Nyquist, heads an evenly matched field of 14 3-year-olds for the 92nd running of the $250,000 Pat Day Mile (GIII). The Pat Day Mile will go as the 10th race with a 4:25 p.m. post time. Trained by Doug O’Neill, Ralis enters Saturday’s race off a fifth-place finish in the Spiral (GIII) at Turfway in which he was beaten less than a length. Mario Gutierrez has the mount on Ralis and will break from post position two. Four horses who were on the Kentucky Derby trail also are in the field: Jacks or Better Farm’s Fellowship, the third-place finisher in the Florida Derby (GI); Xpress Thoroughbreds’ Discreetness, winner of the Smarty Jones at Oaklawn; Brittlyn Stable’s Forevamo, runner-up in the Risen Star (GII) at Fair Grounds and Calumet Farm’s Star Hill, who was third in the Tampa Bay Derby (GII). The field for the Pat Day Mile, with riders and weights from the inside, is: Discreetness (Jon Court, 120 pounds), Ralis (Gutierrez, 118), Torrontes (Sophie Doyle, 118), Gray Sky (Channing Hill, 118), Imperial Hint (Antonio Gallardo, 118), Sharp Azteca (Edgard Zayas, 118), Forevamo (Florent Geroux, 118), American Dubai (Francisco Torres, 118), Fellowship (Jose Lezcano, 118), Cocked and Loaded (Irad Ortiz Jr., 118), American Freedom (Javier Castellano, 118), Unbridled Outlaw (Victor Espinoza, 118), Star Hill (Corey Lanerie, 118) and Lookin for a Kiss (Paco Lopez, 118).